Secure Self Storage | Lowest Prices in Town. 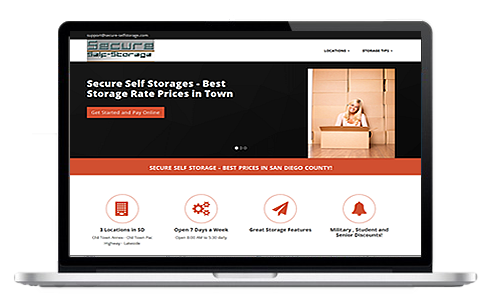 Secure Self Storage - Lowest Prices in San Diego County! Military , Student and Senior Discounts! Secure Self Storage has the lowest prices in town. Secure Self Storage has 3 convenient locations in San Diego to help with your storage needs. If you are looking to store in the areas around Lakeside, Pacific Highway and Old Town, look to us for the most affordable rates in San Diego. Our facilities are open to serve you 7 days a week. We offer affordable and secure storage units for all your personal and business needs. Our Pacific Highway and Old Town locations also offer vehicle, RV and boat storage. Payment options vary. No deposit required. All contracts are a month-to-month. Auto pay is always a worry free way to pay. We are a customer service oriented storage company whose goal is to make your self-storage experience stress-free. Contact our friendly and knowledgeable staff, they will guide you through the entire storing process. Secure Self Storage is perfect solution for businesses needing extra space for excess inventory, records, files, seasonal promotional materials and product samples. Reduce your business costs, avoid long-term lease commitments, and get only as much storage space as you need. Whether you are looking for something small or large, short or long-term. We can help find the right space at the right price.